Florence could dump a staggering 18 trillion gallons of rain over a week on North Carolina, South Carolina, Virginia, Georgia, Tennessee, Kentucky and Maryland, meteorologist Ryan Maue of weathermodels.com calculated. That’s enough to fill the Chesapeake Bay, or cover the entire state of Texas with nearly 4 inches of water. More than 23 inches have fallen in some towns. With tropical storm-force winds swirling 350 miles wide, Florence continued deluging North and South Carolina on Saturday morning after pushing surging seas far ashore. Forecasters warned that drenching rains totaling up to 3.5 feet could trigger epic flooding well inland through early next week. 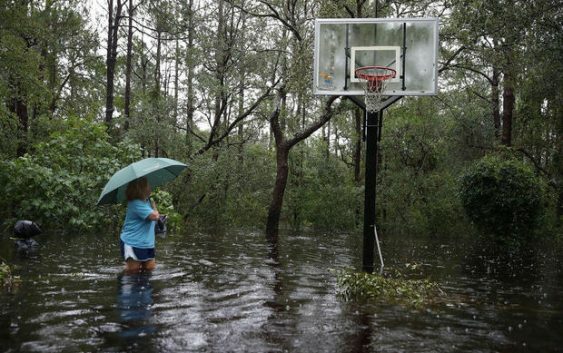 Morehead City, North Carolina, had received 23 inches of rain by Friday night, and forecasters warned Saturday morning that parts of the Carolinas could get up to 15 inches more. Florence flattened trees, buckled buildings and crumpled roads. The storm knocked out power to nearly 930,000 homes and businesses, and the number could keep rising.